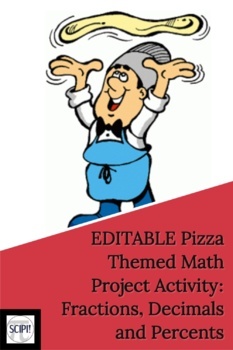 This is a seven page summative math assessment with the theme of pizza and comprises seven questions that center on fractions, decimals, and percents. It may be given as a final test or as a summative project. The seven questions use three levels of Bloom’s Taxonomy (remembering, understanding and applying). 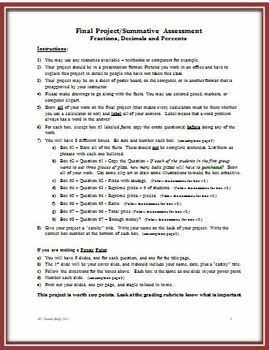 Specific student directions are provided, and three boxes of a sample project are included in the students’ three page handout. 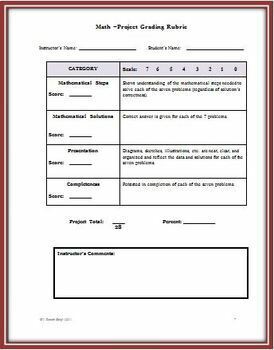 The answer key and a seven point grading rubric are added for the teacher. Students are given the option of presenting the project in a variety of ways, including using a power point. This document is not saved in PDF so that the teacher may adapt it as needed. Also available is an alternative fraction summative assessment. Below are other fraction assessments available at my store. Just click on the link.